It’s actually in Terminal 3-F, but very close to the airside hallway to International-G.
Well, it's probably closer to more International-G gates than to gates in Terminal 3. The bar renovation is under way. There's a temporary bar set up with a limited menu. They told me it'd take around 5 days to complete and we'd be back to normal. Surprisingly not crowded at 1pm on a Tue. Any sense for why they're renovating a bar that is roughly 3 years old? My understanding is that it's just routine maintenance and that it's not a full remodel. Basically, there's nothing noticeable in it for us, but it'll keep things running smoothly longer term. But what do I know… I could be way off here. 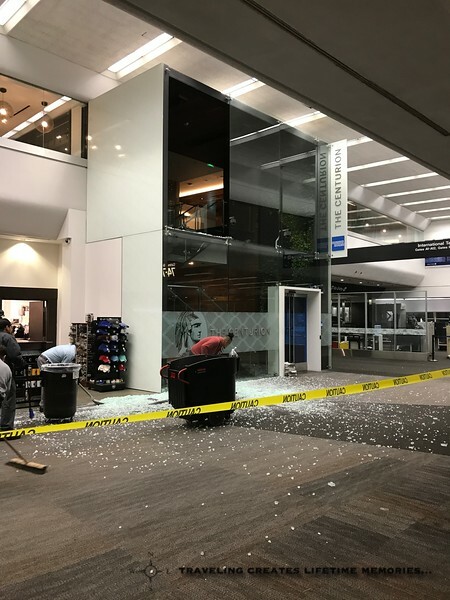 Not sure how this happened but this is the current state at the Centurion lounge in SFO. What, did they install a sunroof in place of a regular window? Goodness. That could have been very ugly if during peak times. Wow.. You would think they would put a layer of shatter proof film on it, especially since people walk by it. I hope somebody didn't mistake it for the door. Maybe some techie figured out how to trick the wine tasting dispensers into unlimited pours. Then, a wrong turn on the way out. But seriously, it looks like the whole pane fell intact and then shattered on the ground. Really bad news if something that heavy hits you on the head. Looks like tempered glass to me. Designed with internal strain to shatter into many small pieces as seen in the picture, avoiding longer and much more dangerous shards that can cause worse injuries. Also would have caused the window to shatter on impact, preventing heavy pieces of glass from falling onto people. Such glass is standard equipment in chemistry laboratories and in autoglass (in combination with lamination in some areas). I claim no expertise in this whatsoever, but doesn't it look like it came down completely or mostly intact and then shattered on impact with the ground? Seems to me the spread of the pieces would be wider and more even if it shattered from up high. In the photo we see a big concentration of pieces along with width of the pane.